There’s no doubt that chemotherapy treatment is hard on seniors. It can cause all sorts of side effects, including difficulties with eating. However, getting the proper nutrition during chemotherapy is important to keep them feeling as good as possible. Good nutrition can also help them to recover more quickly and stave off other side effects. But, it can be hard to know what to do to help your aging relative to meet their nutritional requirements when they may not feel like eating. 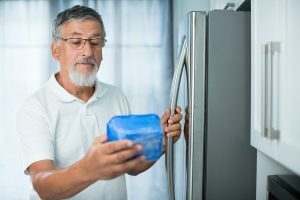 Below are some tips to make the most of the times when the senior wants to eat. When your aging relative is up to eating, offer protein-rich foods, and opt for foods that are higher in calories. Calories are necessary for the body to produce energy. Proteins are required for building new cells, which can help with healing. If the older adult has trouble swallowing, a shake or smoothie can be a good choice. Talk to the doctor or dietician about whether a protein supplement added to shakes and smoothies is appropriate. Elder care providers can prepare protein-rich snacks throughout the day, including shakes and smoothies. Chemotherapy can change the way things taste to a person. Many chemotherapy patients say that meat and plain water taste bad to them. If water becomes distasteful, try adding lemon to the water or making infused water using cucumbers or fruit. If meats are a problem, look for other sources of protein, like fish, eggs, or legumes. Elder care providers can help find foods that taste good to the older adult. They can cook eggs, a fish filet, or soups that contain legumes and keep track of the foods that work well. Although it’s best for healthy people to eat a varied diet to ensure they get enough nutrients, variety isn’t as important for chemotherapy patients. Let them eat whatever is easy to eat and tastes good to them. It’s okay if they want the same food over and over. It’s more important that they simply eat. Liquids are important to prevent dehydration. Liquids are especially important on days that the senior doesn’t feel like eating solid foods. Aim for between 8 and 12 cups per day. Keeping a water bottle near the person’s chair or bed can be a good way to ensure they drink enough. An elder care provider can bring the senior drinks and keep track of how much they drink.